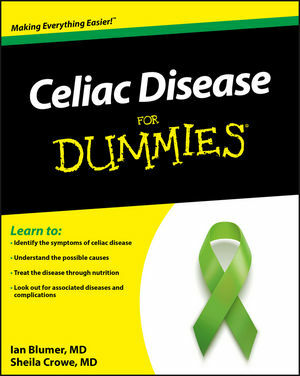 Celiac Disease For Dummies is the ultimate reference for people with the disease and their family members. The book helps readers identify symptoms of the disease, and explains how doctors definitively diagnose celiac disease. It outlines how celiac disease affects the body, and what its consequences could be if untreated. The authors explain how celiac disease is treated, not only through the elimination of gluten from the diet, but with additional nutritional measures and alternative and complementary therapies. Written by two practicing physicians, the book also offers practical, helpful guidance for parents of children with celiac disease, whose treatment may be a particular challenge. Ian Blumer, MD, is a specialist in internal medicine in Ontario, Canada and has an appointment with the University of Toronto. Dr. Blumer lectures across North America and appears regularly on television, radio, and other media. Sheila Crowe, MD, is a professor of medicine at the University of Virginia in Charlottesville, Virginia, specializing in digestive diseases including celiac disease. Dr. Crowe is named in "Best Doctors in America." Part I: Dealing with the Diagnosis of Celiac Disease. Chapter 1: Finding Out You Have Celiac Disease. Chapter 2: Celiac Disease and You. Chapter 3: Diagnosing Celiac Disease. Chapter 4: Screening for Celiac Disease. Chapter 5: What Type Am I? Looking at the Forms of Celiac Disease. Part II: How Celiac Disease Can Make You Feel. Chapter 6: Symptoms of Celiac Disease. Chapter 7: Conditions Caused by Celiac Disease. Chapter 8: Conditions Associated with Celiac Disease. Chapter 9: Celiac Disease and Cancer. Part III: Treating Celiac Disease. Chapter 10: Treating Celiac Disease with a Gluten-Free Diet. Chapter 11: Exploring Other Nutritional Considerations. Chapter 12: Are You Responding to Your Gluten-Free Diet? (And What to Do If You Aren’t). Part IV: The Long-Term: Living and Thriving with Celiac Disease. Chapter 13: Alternate and Complementary Therapies. Chapter 14: Celiac Disease and Pregnancy, Children, and Beyond. Chapter 15: Ongoing Care of Celiac Disease. Chapter 16: What the Future May Hold. Chapter 17: Ten Frequently Asked Questions. Chapter 18: Ten Tips for Living Successfully with Celiac Disease. Chapter 19: Ten Myths, Misperceptions, and Falsehoods about Celiac Disease. Appendix A: Web Sites Worth Visiting. Appendix B: Organizations for People with Celiac Disease.